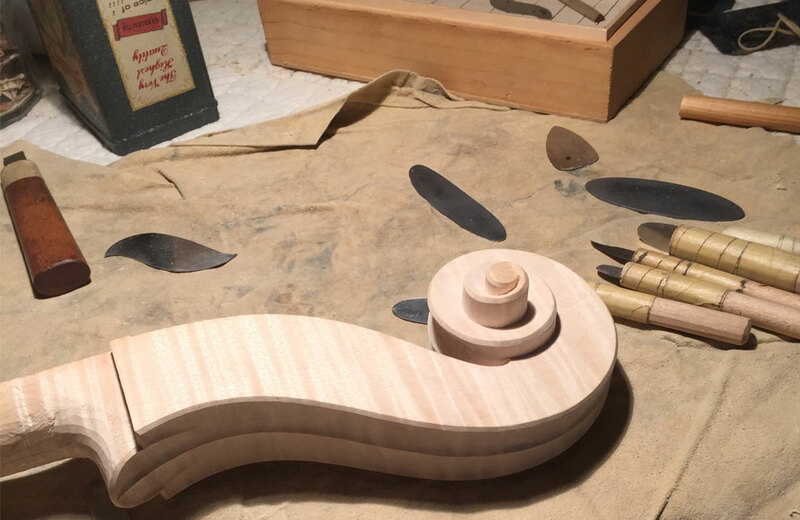 The distinctive scroll found at the top of fine violins, violas and cellos is a purely decorative woodcarving that showcases the violinmaker’s skill as a maker and craftsman. The concept originated in the Baroque era. Typically the scroll carving is shaped like a volute, or rolled up spiral, but they historically also appeared as human or animal heads. The scroll is carved from the same block of wood that also includes the peg box. First, a block of wood is resized to the widest and longest measures of the scroll and peg box down to where they meet the neck. A violinmaker will often use a template that illustrates the shape of the scroll from the side and the front. Once excess wood is removed, the template is traced and the outermost edges are cut in both dimensions using a band saw. The volute is then traced onto the side and front view of the scroll. The saw follows the side tracing while turning the wood and only going as deep as the line on the front, stopping at the bottom of the scroll before it curves up again and cutting across. After that, using sandpaper as well as scrapers of various sizes, the rest of the spiral is carefully designed. Going around the center point, the spiral’s radius gets shorter, and the cuts are less deep with each turn. Finally, chamfers, the curves about 2 mm deep between scroll layers, are added using a scraper. Two flutes are delicately scraped into the top of the scroll going down the back. Once the violinmaker finishes the scroll, the peg box and neck are shaped and the fingerboard is ready to be glued on. The peg holes are reamed and the neck is ready to be attached to the body of the stringed instrument. While the shape of the scroll does not affect the sound or tone of the violin, it contributes greatly to the beauty of the instrument. Fancy, intricate scrolls are found mostly on fine violins, violas and fine cellos. Many modern makers specialize in scroll carving and are renowned for that skill.